“…so we just took her home to wait for a bed in the good hospital, which was going to take a few days, according to him [the psychiatrist]. He said to keep a watch on her, remove all the knives, put sheets over the mirrors so she can’t see herself, because that would set her off. And of course, make sure she doesn’t kill herself, or anybody else.” June, from Daughters of Madness, when she and her sister (ages 13 and 15) sought treatment for their mother in the 1980s. I’ve been reading Growing Up With a Schizophrenic Mother by Margaret J. Brown and Doris Parker Roberts, and Daughters of Madness by Susan Nathiel. 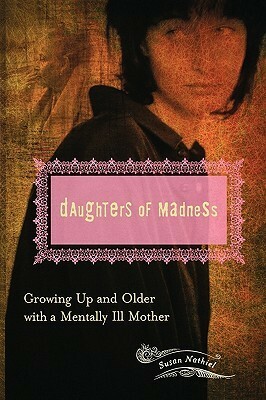 After my last post, Children of Mental Illness, I was thrilled to hear from author Susan Nathiel. Susan tells me she will publish Sons of Madness this August. There are fewer interviews in her forthcoming book than in Daughters of Madness because male volunteers were harder to find. Susan says, however, that the interviews included in her new book are excellent. I’m glad to hear about this new publication, because there still isn’t a lot written about the experience of growing up with a seriously mentally ill parent. When I was coming of age in the 1960s and 1970s, I thought I was the only daughter in the world who had a mother with schizophrenia. Many of the individuals interviewed in these books are baby boomers like me. Some of us had encounters with mental health professionals who were compassionate and helpful, but more often they were uninterested in helping children and teens with a mentally ill parent, unaware of their needs, or not permitted to help by the mentally ill parent or another adult family member. Back then, there was no NAMI (National Alliance on Mental Illness). There were no support groups for families of the mentally ill, little in the way of books or educational materials about mental illness, and no Internet where you could plug in a keyword such as “schizophrenia” and retrieve information. Sometimes, I think that dearth of information and the fact that mental illness was kept secret by all concerned were the reasons I went into communications and later medical librarianship. I wanted a voice that could be heard, and I wanted to give people the vital health information they needed and deserved. Thankfully, things have changed, though I don’t think they’ve changed enough. There are excellent mental health family services at the medical center where I work, and we librarians at the medical library often give information and educational materials to patients. One of our librarians specializes in providing mental health information to patients and families. But mental health care in our country still needs fixing; unfortunately, too many patients and families don’t get the services they need. When I was a teenager, it didn’t occur to my mother’s mental health care providers that I might need to know her diagnosis. Now, when I give a patient or a family member health information, I feel I’m doing a little bit to validate their experiences and make their lives better. But I’m also making up for what I never got until quite late in the game. I’m saying to patients and their families: You matter. You need to know. You deserve the best information we can give you. In celebration of my first anniversary as a blogger, I’m giving away a book to one lucky person who leaves a comment on any of my posts here at Books Can Save a Life in February. There are still a few days left to join the conversation and add your name to the drawing, so please do! Quote from: Daughters of Madness: Growing Up and Older With a Mentally Ill Mother, Susan Nathiel. Praeger, Westport, Connecticut: 2007. Thank you for the update on your mom and for taking the time to stop by and comment. I appreciate that. I’m glad your mom is in a good place now. It’s an amazing book, isn’t it. Yet difficult to read and process. I am reading Daughters of Madness for a second time. It is like discovering a new planet. I searched my entire adult life for answers to the mystery that I called mom. I even became a therapist and spent many years in therapy hoping for insight and ways of coping. It wasn’t until I read Susan Nathiel’s book that I saw myself and felt validated and affirmed as a person. I’ve never felt competent despite a PhD. Now I know why. I understand why other girls knew things about life in childhood and then adulthood and I didn’t. Basically it was because my mom didn’t talk to me. There was no one to mediate the world for me and so when others were doing age appropriate and typical things and seemed to have some kind of inside information, I was forever the outsider looking in and wondering why I was different. I am a baby boomer and my mom is now in an assisted living facility. She was recently kicked out of a facility for her angry and demanding ways (vicious is not exaggerating). I felt vindicated and sad. My gratitude to Susan Nathiel knows no limits. She has helped me beyond measure-literally saved a life. Diane, thank you for sharing this. Susan Nathiel’s book has made a huge difference to me, too. I appreciate your stopping by and commenting. If you happen to find similar books and authors, I would love to know about them. I am a boomer, too, and I think this is a huge issue for those of us who grew up in an era when there began to be tremendous freedoms for women, but at the same time there was so much silence and stigma surrounding mental illness. And lack of support and assistance. Thank you Valorie. I just finished the last page of Daughters of Madness and took a deep breath. I devoured it the first time through but this time, I was able to go slower and think as I read. Here is an update on Mom. She is in a new assisted living facility and for the time being, she is content. There are activities and friends and she is doing much better. Her medications are monitored and that is making a huge difference. I’m relieved for now. There is never a feeling of completeness as you know.